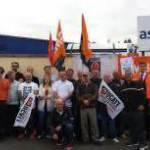 Aspire Housing workers are taking a further twenty four hours strike action on September 1st. Members of Unite, UCATT and the GMB are taking action to defend their pay and conditions. Management have refused to negotiate or take the issues to ACAS for conciliation. The dispute concerns the company’s plans to cut workers’ terms and conditions from 1st October in which some workers could lose £5000 per year. The cuts include a reduction in sick pay, an increase in hours and the ending of tool allowances and insurance guarantees. Pay and holiday entitlement is also being slashed for new starters and the company has refused to guarantee that these changes will not be introduced for existing staff. In contrast to the treatment of staff housing association bosses have become notorious in recent years for bumper pay increases, but the hypocrisy of Aspire management stands out as particularly outrageous. With a basic pay packet of £137,382 Aspire’s group Chief Executive Sinéad Butters is the highest paid housing association boss in country both in terms of pay per home managed and in relation to turnover according to the Inside Housing survey. She also has the third biggest pension contribution on top of her pay (£36,818). Unite LE1111 branch secretary Suzanne Muna and chair Paul Kershaw have sent a solidarity message from our branch. Pickets will be at the Newvstle under Lyme depot. Four days of industrial action were previously taken in July.